Increasing the tracking level on your website is useful to speed up the analysis of the performance of all your online traffic sources. Generating statistically significant findings requires having confidence in your data but when you only have a couple of conversions and are paying significant sums of money for online advertising, additional tracking will surface the high and low performing areas in your account faster - and time is money. For niche products coming to market and learning about their customer base, increased tracking speeds up the process of finding the next area to focus on. When you opt for an Advanced Analytics Setup with Tomachi Corporation, you will be supplied with a customised training manual that includes a record of all the settings we have changed in your account, and lifetime support of the protocol tracking script. When site visitors hover and click on email links, an event will fire for each hover and click that also tracks the email address in question. This allows you to see how many hovers and clicks are occurring on your various email addresses listed on the site. No change is required to any code and you can continue to use the normal methods you use to insert email links - so long as they are of the standard mailto: format, they will be automatically picked up by our script. With a small addition of a div tag to identify the form, we can also track when visitors hover and click on your form elements. This is useful for sites which have lead-generation forms. If the phone numbers on your website use the new tel: hyperlink format, they will be automatically picked up by our tracking script - with no change required to your site code at all. The script picks up the number and includes this in the event label. Here we will discover the IP address of your various offices and compile these into your analytics manual, and configure a custom filter in your analytics account. At the same time, a Raw profile is created that does not have the staff filter applied, and optionally we can create a staff only profile if desired, which will only contain the activity of your staff and developers. A raw profile is a duplicate of your Main profile, but with no filters added to it. This is useful for the occasions when the design or application of a filter causes accidental data loss in the account. Having a raw profile is useful and provides a backup for those cases. We will duplicate all the goals for both raw and test profiles when creating them. A test profile is used for experimenting with advanced filters and is usually only required when a new filter idea is being developed, and it is important not to disturb the data in the Main profile. We can add event tracking to your Add To Cart buttons in a variety of ways. In some cases, such as on the WooCommerce plugin for WordPress, this is a simple matter of activating the tracking feature in the program. For other systems, we'll try to recommend the best practice method of tracking these, and for all others we simply add one line of code to each button to fire an event at the precise moment the user clicks "Add to cart". For WooCommerce, the product SKU is recorded in the event label. If desired we can also work with your developer to record the product label itself in the event for easier analysis, and we can also optionally tracking the value of the event as an event value. If your analytics account commerce values are used in Adwords for optimisation, we can optionally filter the event values for your Main profile, but let the values through into a dedicated "Add to Cart Value" profile, to avoid cluttering up your Main profile with non-commerce values. Most sites can benefit from having a time on site goal configured. This is especially true for sites with large amounts of information or large product range, but also useful for sites with low traffic or conversion rates, because it provides a good natural proxy for conversion in cases where only a very little amount of conversion data exists. These all have the following report tabs: Goal set 1, Goal 2, Goal set 1 and 2 Combined, Ecommerce. You will be consulted on any reports that you would like to see and we can configure a totally custom report for you to put various dimensions and values alongside each other. We'll discuss your individual reporting requirements and create a tailored custom dashboard in your analytics account for you. 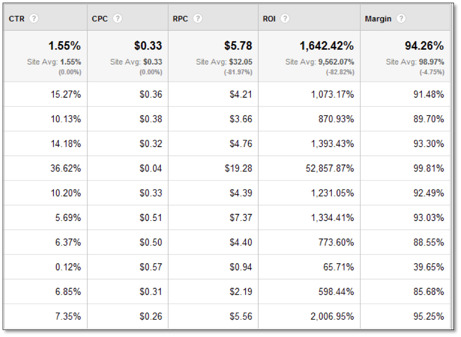 This is a good place to include comparisons of branded versus generic (non-branded) keyword traffic, and we can write regular expressions specifically for this task. Once a custom dashboard is setup, we can configure this to generate automated PDF reports sent daily, weekly, monthly or quarterly. If your website contains an internal search facility, we will enable tracking of this in your account. Note that this requires that the search form use the method=get method. 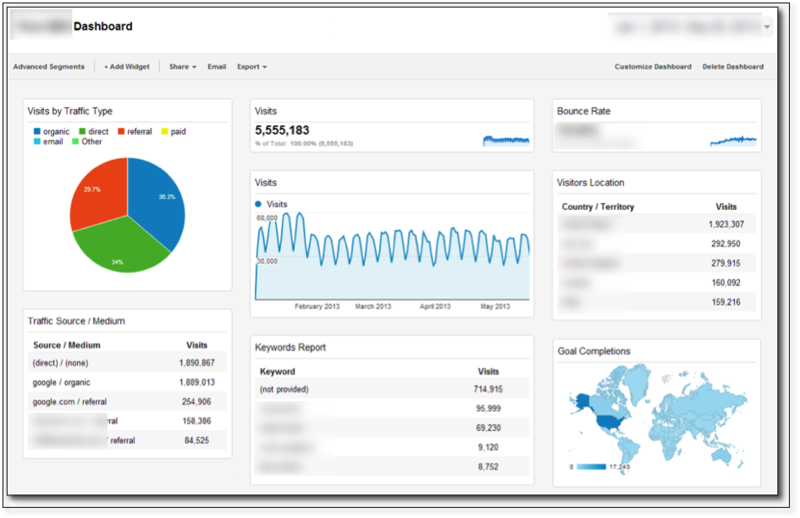 Google Analytics has some great built-in functionality to track ecommerce transactions, yet many online businesses in New Zealand do not take full advantage of this. In the past, integrating with GA ecommerce tracking required some additional development work, but nowadays the majority of shopping carts and CMS systems directly support this type of tracking. All the reports above can of course be sliced and diced according to your data requirements. For example, you can see top products or average order value of different locations to see what people are ordering in different cities and countries; see the conversion rate of different traffic sources. Do you have an industry which is strongly promoted via word of mouth? In the online world, "word of email" is the phrase we'd likely use to describe email based referrals. We aren't talking about email marketing here - for your email push campaigns these should already be tracked using Google Analytics Campaign tracking, using the URL Builder tool or your ESP's (email service provider like Mail Chimp, Constant Contact, Campaign Monitor etc) automated tracking system. It is as if someone has clicked on a link from mail.google.com - and in reality they have, but it would be great to have a little more intelligence around this traffic type rather than have it blend into all the other traffic coming from your referring websites. And it would also be great to be able to easily differentiate between "word of email" referrals and actual link clicks from partner sites. Most business owners and web analysts included have trouble separating branded search traffic from generic (non-branded) search traffic. This is an important distinction to make because while their rankings for brand phrases are normally very high, and with high conversion rates, it is the generic traffic that contains the much higher level of traffic and new customers. People searching for your brand are obviously already aware of your product and may have already visited your site, whereas people searching for generic keywords associated with your product are much less likely to be aware (or they could be shopping around to find the best deals). The problem is that just typing in your brand ("Tomachi Corporation") into the search box on GA does not cleanly capture the entire theme in one hit. You often find misspellings and alternate ways of using your brand that would require stitching together a great number of reports and is essentially not feasible. It would not capture "tomachicorp" (without the space and shortened) for instance, nor would just using the shorter "tomachi corp" as a search filter be satisfactory. The solution involves creating a custom regex (regular expression) that can be used in various places like the keyword search box in Google Analytics. A regex allows dynamic matching which is able to deal with multiple variations of your brand. This would pick up mis-spellings as well as past brands (if you have re-branded), and can include any number of sub-brands. Sub-brands such as company directors and key products can be added to the expression in cases where these get a significant amount of traffic. 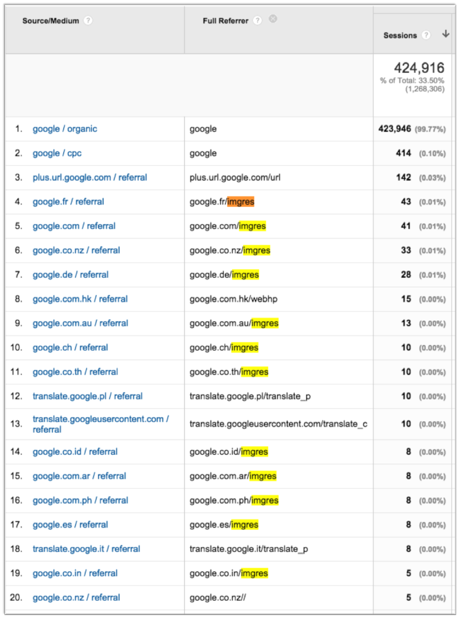 Using this regular expression we can see how it affects the reports, on the left we have our branded keywords as detected by the regex, and to the right are our generic top keywords. This information is quite valuable and usually provides actionable insights on what to optimise for next. For example, "anchor text distribution" could be a good choice for further optimisation based on it driving the most clicks. 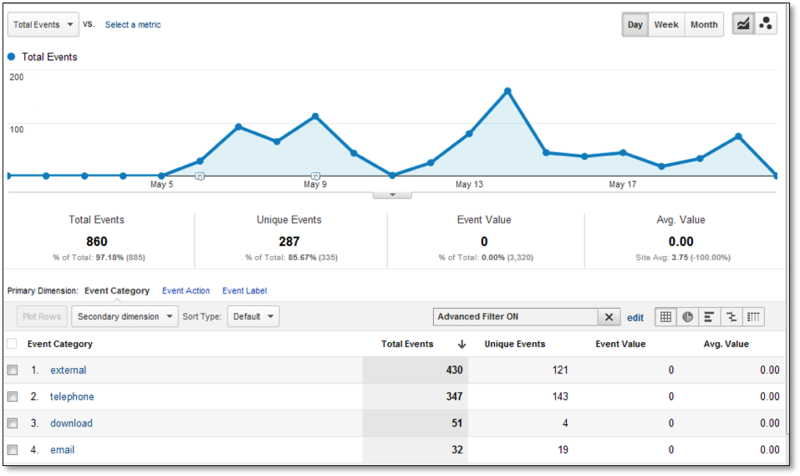 See how engaged your visitors are. If you use a 3rd party payment gateway that is showing up as the source of traffic of all of your conversions, an install or audit of your cross domain tracking configuration may help. Often this is the way to fix the issue where Paypal or DPS Payment Gateway is the referral source because the user needs to click back to your website after the transaction. If you own multiple websites a roll up tracker can be used to see all of your network in one view. A filter is added to make it appear as if they are children of a folder with the domain name as the folder name. CDT (Cross domain name tracking) is also usually enabled for the roll up trackers, but not for the the individual trackers. This way if you have “feeder” sites in your network that send traffic that converts, you can now “see past” that source as a referral and into the previous source when viewed in the roll up tracker. We search for regex google(. *)imgres in the Referral path and rewrite the medium from referral to organic, and the campaign source from the various many Google domains to just “google images”. Country of the engine can then be seen in the Full Referrer detail.